RIDERS application, which has become the best project among fitness startups in the Chain Reaction Awards, is intended for extreme sports lovers. The future entrepreneurs Igor Debatur and Anatoly Chernyakov were inspired by their own experience to create an application that teaches skateboarding tricks. “When we started doing our first tricks, it was very difficult to find good training materials, and there was no one who could perform them well, so we had to seek information on the Internet,” says Debatur. 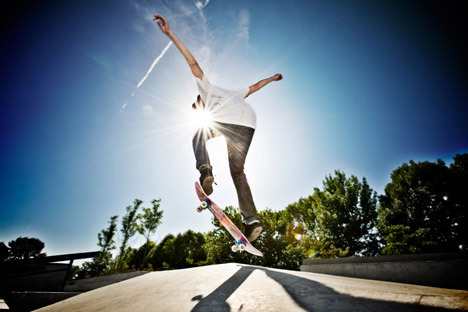 For those who love the adrenaline rush, this resource contains more than 700 video lessons that teach new skateboard, BMX, wakeboard, MTB, snowboard and ski tricks. The content can be filtered by type of sport and level of difficulty. In addition, users can share their own photos and videos of tricks, mark their progress in the development of new techniques, and monitor the achievements of other participants. Debatur emphasizes that their product has no equivalent. “There are applications that teach tricks in a particular sport, but there is no single database and there is no such community of riders. The RIDERS project is unique in this respect,” says the entrepreneur. The project was launched on August 28, 2012, and, less than a year later, the RIDERS application came out in the beta testing version on March 25, 2013. The money for the creation of the RIDERS came from the earnings of the first project of Debatur and Chernyakov — the Whitescape Company. This was started by the entrepreneurs in 2008. Now they are engaged in the development of web projects, iOS and Android applications, and in the design of interfaces for such major clients as MTS, Strelka, WWF, Selectel, Intel and Kaspersky. In addition, six months after the launch of the final version, the RIDERS received a seed investment from a business angel. The application is free: Its creators earn money from the advertising. “We provide companies with the possibility to create branded video tutorials and to present them in the application,” says Igor. Currently, the RIDERS has about 30,000 subscribers, and the application holds top position in the “Sport” category on the App Store. “In addition, we have gathered a huge community of riders in social networks: VK, YouTube and Instagram,” Debatur says. The main objective of the creators of the RIDERS for the near future is to enter foreign markets. To do this, the young businessmen are going to visit New York, Los Angeles and San Francisco this fall, in order to meet riders and key players in the industry of extreme sports. In addition, the RIDERS will take part in Europe's largest startup competition, WebSummit, in October, where the application will be presented to international audiences. “Our objective is to create a platform that will bring together all those who like extreme sports — not only riders, but also photographers, camera operators, media, event organizers, etc.,” says Debatur. In addition to the content support by riders from around the world, the creators of the application are already cooperating with photographers and operators from the United States, Russia, Peru, Mexico, Indonesia, Australia, Finland and other countries.